Coming up for air / Bravo Maria and Simão! Oops, I've been so busy I haven't been blogging…but time to get back on the saddle, because there is a lot to write about! To start off, just a sweet photo of two ESART students, Maria Paixão (entering 3rd year) and Simão Francisco (completed Masters in Teaching in 2017), together in Tomar. As Simão was Maria's teacher, at the Canto Firme School of Music, where he is Professor of Flute and also the Director (! ), you can sense in the photo the special connection between students and teachers, and a love for music that is what makes me enjoy teaching so much. 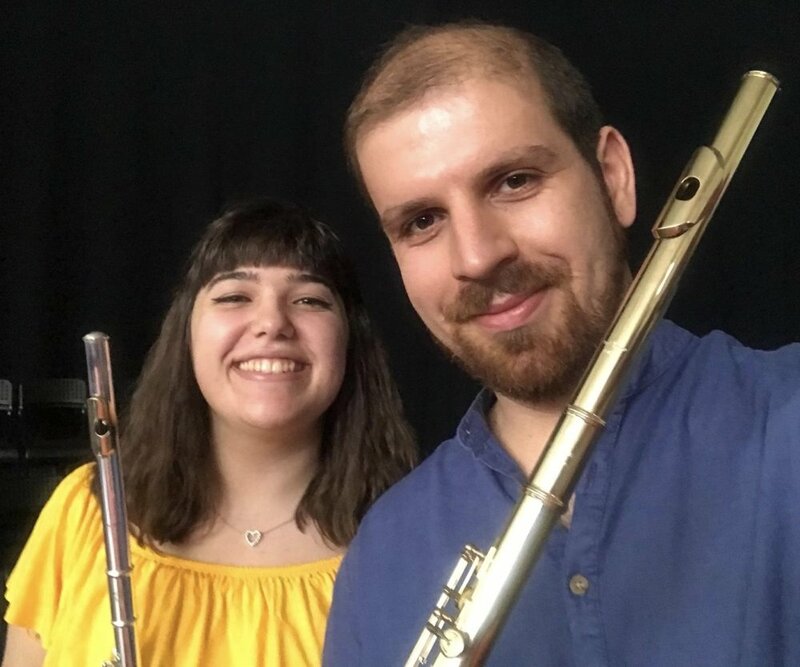 Shortly after this photo was taken, Maria won 1st Prize in the "Sons de Cabral" competition in Belmonte, and Simão was busy directing the flute ensemble and helping organize the 6th Summer Flute Academy in Tomar—congratulations for two jobs extremely well done! ESART - Auditions Overflow with Talent! It was an exciting, if long, day at ESART last Sunday! My wonderful colleague (and Powell player) Professor Stephanie Wagner and I listened to twenty candidates for the Bachelor's program (licenciatura) — this was a tie with last year's number, and the largest applicant group by instrument! To the hopeful candidates performing for us, it is of course very stressful, but an important thing to know is that what any jury really wants to hear is GREAT PLAYING! We are "with you" out there on the stage, we've been there, too! Never think the jury just wants to toss people off the ship—it really is not like that! And we were extremely pleased with the level of the young flutists! For someone who has been in Portugal for quite some time, you might say the level would have been unimaginable even 5-10 years back. Therefore, we congratulate the hard-working, dedicated teachers who have produced such fine young players! Lastly, we thank all twenty flutists for making the effort to be there and putting out your best! Bravi tutti!! Welcome to ESART - a Dear Colleague! This is only "news" because I was away from the blog for some time following the India tour: join me in welcoming to the Flute Faculty at ESART the wonderful and multifaceted flutist Stephanie Wagner! We will be team-teaching there, in Castelo Branco from here on out! I am very honored that Stephanie is able to put her wide-ranging professional experience at the service of the class, with a complementary angle to mine! Together, we have already "produced" four editions of the Summer Flute Academy (which was her brainchild!) along with our terrific colleague Raquel Lima of ESMAE, so we are enjoying extending the collaboration throughout the school year! Stephanie, a native of Lisbon, has held orchestral positions in Germany, performed piccolo with the London Symphony Orchestra, studied at the New England Conservatory in Boston, USA, and the Hochschüle in Munich, Germany. She has now been the flutist with the Remix Ensemble-Casa da Música in Porto for over ten years! You can check out all her activities on her site! She is also a longtime Powell Flutes player, both C flute and the piccolo in the photo below! And she is the Portuguese rep for Kingma Flutes, playing the Kingma alto, bass and contrabass with Remix. We have a love for new music in common; composers should check out her "UnlimitedFlutes" project! Anyway, this weekend we'll be doing a "flute marathon" with the ESART class—photos forthcoming! Powell Flutist Stephanie Wagner, with the smallest flute of her collection! ESART - Line Up Your Ducks! Dear prospective students of Superior Courses in Music: this blog entry is FOR YOU! In English we have an (odd) expression: "lining up your ducks". This means getting all the preparation you need organized BEFORE the moment of an audition or applying for a course of study. I cannot stress how important this is for those trying to enter into Superior-level Music Courses; these have become highly competitive in recent years, and aside from preparing your playing audition, you ought to prepare to the best of your ability for the written exams, especially including the REQUIRED NATIONAL EXAM(S). Take note: these requirements can and DO change with some regularity, and it is NOT EASY to keep up with the changes. However, you simply must, or you risk being accepted and then not being able to matriculate for lack of an exam or lack of passing an exam. This may seem unfair, but at the same time, you should realize that all University-level courses are highly underwritten (i.e. paid for) by the government, and so it would be normal to expect incoming students—"even" in music, art, etc.—to be functional in Portuguese and so forth! So, practice, yes, indeed, but also: LINE UP YOUR DUCKS!